Blueberry Coffee Cake starts with cookie-crust base, then a layer of blueberries enveloped in a sweet cake-like batter topped with pecans. Fresh blueberries take me back to summer on the farm in Indiana–specifically my brother’s house. Good food is always happening in my sister-in-law’s farm kitchen. 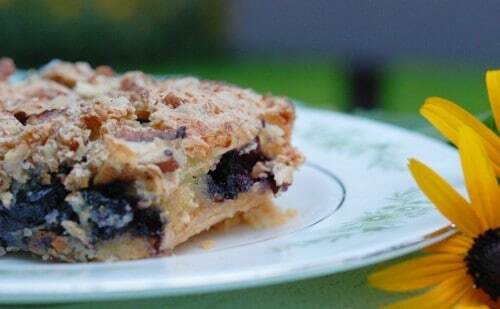 Susan generously shared this Blueberry Coffee Cake recipe with me a few years ago. I’m pretty sure she uses blueberries she has picked herself. Even though there is no opportunity to pick my own blueberries now, the coffee cake is still fabulous with the fresh berries from Costco or Kroger. Blend together in food processor until particles begin to stick together. Press into 8×8 inch square dish. Bake for 25 minutes at 350 degrees. Scatter blueberries on top of baked base. Combine remaining ingredients except pecans and pour over blueberries. Bake in oven preheated to 350 degrees F for 25 minutes or until golden brown. I made this. I substituted with sprouted whole spelt flour, a little bit of brown sugar in the cup of regular sugar (cause I ran out of sugar). I used frozen blueberries. It turned out “softer” than I expected with a sort of mushy middle (not bad though) the base was not hard or crisp, which I thought it would be. This was good. I tasted the butter alot (I love butter) but I wonder if the butter could be cut down a bit? I also thought it was too sweet. Next time I will cut some of the sugar. I have never used the sprouted whole spelt flour which would most certainly produce a different kind of product. The base is rather crispy when you use regular flour. I have not experimented with less butter either. Also, frozen berries will tend to make any bake product a little mushy. Good luck. I fixed it. Looks like I had cut off the last sentence. “Bake at 350 for 25 minutes.” Thanks again for taking the time to let me know. I made this for Sunday brunch after church, and it was delicious! The shortbread crust is scrumptious, and borders on dessert. Thanks so much. Yes! This is a dessert. And it’s fabulous with fresh or frozen blueberries. Writing this has given me the idea to try it with frozen strawberries. Wonder how that would work. Thanks for bringing this recipe to the forefront of my brain again.